Preference 2: I support this preference with safe pedestrian and bicycle connections. I strongly support bicycle and pedestrian shared-use paths on the Roanoke lid. I strongly support this pedestrian access to multiple local and regional parks. Preference 8: I strongly support WSDOT not just studying but actually implementing a pedestrian and bicycle trail on the Portage Bay Bridge. Preference 9: I strongly support further planning for safe, direct, and comfortable walking and biking in this area. I support this preference in order for the multi-use trail to better connect east-west. While I support the goals of this preference to create a multimodal hub somewhere in the project area that is safe and pleasant for all users, there needs to be a new approach to the design that better supports active users. I only support this preference for pedestrians and only as a partial solution: pedestrian and bicycle access should be entirely separated from car and HOV traffic. Preference 15: I support continuing to work with the city of Seattle to enhance the connectivity for pedestrians, bicyclists and transit users. The current proposals are not satisfactory. I strongly support a shared use path along the SR-520 bridge. Goals. What is your feedback on these goals? The goals are good. But, the design for the Montlake Lid and the entire Montlake Blvd E. Corridor does not reflect adherence to these goals. It seems that the design for the lid was created without understanding of automobile, transit and most especially pedestrian and bicycle traffic in the adjoining neighborhoods and this sector of the city. 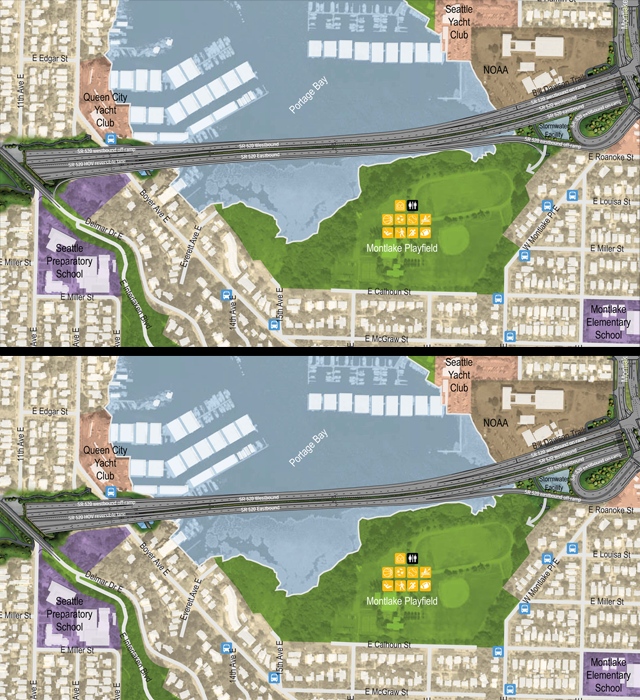 Instead of creating a space designed for safe, direct and efficient pedestrian and bicycle crossings, reuniting neighborhoods and creating vibrant connections that benefit the entire region, the lid appears to be conceived simply as a way to hide the SR 520.